Thinking Out Loud On Purpose: What State Are You In? I don't know about you, but occasionally I wake up in a different state than the one I slipped off to sleep in. My body may stay at the same location but at times my mind and spirit go on vacation. Some trips are better than others. For instance, I have visited the "state of confusion" on several occasions. It is a noisy, unnerving place. The "state of worry" is a place I sometimes find myself in. It is known for the large shadows that are cast upon everything. The "state of dis-ease" is a far too familiar place. I have not merely journeyed there on occasion but was forced to stay there under very unpleasant circumstances for long periods of time. I once traveled from a "state of hope" to the "state of hopelessness" at the speed of light. Fortunate for me, I brought my "road map" so my best friend Jesus could help me find a route that took me to "the state of grace…leading to glory." Often times I have traveled to the "state of forgiveness" having found that it is one of my favorite places. It is a warm place where the Son shines brightly. I also enjoy the "state of joy" because is a fun place where hearts are light and free. Of all the states I have traveled to my personal favorite is the "state of total surrender." It is a beautiful place with an atmosphere that can only be likened to paradise. There is nothing but glory there with brightness streaming out from every nook and cranny. If I had to make a move, and stay there forever, this is the state I would choose. Unfortunately, we do not always get to choose what state we are to visit or even live in. The circumstances and situations of life move us from here to there. God’s will and purpose plans trips for us as well. We find that we have a non-refundable ticket and we must go. 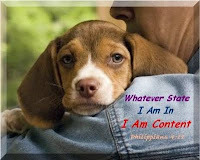 Paul the apostle made a very powerful statement when he said, "I have learned whatever state I am in to be content." Paul knew the importance of being content. He also knew that godliness with contentment brings great joy. How did he know this? He had experienced it and NOT in the best of circumstances since most of what he penned was from a prison cell. There is a great lesson to be learned from the life of Paul. No matter what state we may find ourselves in, regardless of if we are coming or going to a place that is negative or positive, we can experience joy. Why is joy so important? Because the joy of the Lord is our strength. We need His strength not only in our current state but for our future travels as well. Today, what state did you wake up in? Are you able to find a sense of contentment there knowing that your Father has your entire lifetime mapped out in a manner that will bring glory and honor to Him? Let’s take a lesson from Paul and choose to be content no matter where our journey leads. We are traveling in the arms of the greatest tour guide of all times. He is worthy of our trust. Besides, there is a whole lot of joy riding on the journey. Boy did I need that! Perfect for the "state" I am in right now! Trying so hard to be at peace right now knowing that HE is with me through this journey. Repeated contextual clues surrounding Phil. 4:11 ("whatever state I am in to be content") strongly imply Paul had his own varying economic states in mind: plenty and want being the extremes he mentions. That does not mean that application to contentment in non-economic "states" is wrong, only that the original context of the quote should be remembered, since the Scriptures are our guide. Indeed, economic contentment in itself is a worthwhile reminder in these challenging bear market times. And other than my own failures at remaining content, I wonder on the flip side, as it seems, where lack of godly ambition may be a problem. For example, is it not our obligation not to be content with the paucity of the presence of God's kingdom, but rather greatly to desire that God's will would be done on earth as it is in heaven? Or are we to be simultaneously both content with God's present blessings and eager for more, provided the "more" is in accord with what God wants? You make some excellent points. I'm assuming that several of your questions are rhetorical in nature. In other words, I don't have the answers but they are certainly worthy of consideration. Speaking of context, Paul gives the "key" to his ability to be content in the passage as well. "I can do all things through Christ, Who strengthens me." Whether the situation be economic or otherwise, I'm grateful to know that I can receive the same strength that Paul did to find my contentment in Christ.